Hello! I am a Physician, Designer, and Researcher, and the Robert P. Kelch, MD, Research Professor of Pediatrics at the University of Michigan. Hello. My name is Joyce Lee. I am a Physician, Designer, Researcher, and the Robert P. Kelch, MD, Research Professor of Pediatrics at the University of Michigan. I create learning health systems using the methods of quality improvement, clinical informatics, and patient-centered participatory design. I collaborate with human computing interaction and machine learning/artificial intelligence experts to understand how data can be used to solve real world healthcare problems. I study online health communities and patient innovation, and my work supports the integration of the Maker Movement and DIY design into healthcare. For the long version, you can find my CV here. If you share my passions or want to hear my thoughts on the intersection of design and healthcare innovation, please subscribe to my newsletter! Here's to design, healthcare, and innovation! How do I integrate design into my work as a physician and researcher? My approach embraces systems design using the framework of learning health systems; participatory design to support a patient-centered model of healthcare research and clinical care delivery; and metadesign to support the integration of the "Maker Movement" in healthcare. Learn more about the Maker Movement, a technology-focused do-it-yourself (DIY) movement that emphasizes “learning by doing” and empowers individuals to become makers or creators of physical solutions to health problems in this viewpoint. You can also watch my TEDx Detroit Talk "Participatory Design and the Making of Health", my Edge Talk for the Horizons Group of NHS England "The Maker Movement: A Model for Healthcare Transformation? ", and check out our work at HealthDesignBy.Us. I publish academic papers and I blog about design, healthcare, and innovation. 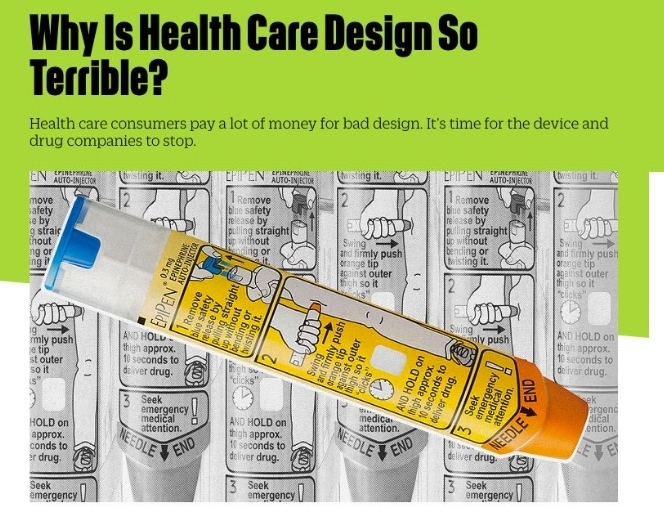 Check out my post in Fast Company Design, "Why is Health Care Design So Terrible?" and a recent post about the design of the Epipen: The Role of Metaphor in Design which was featured in a Propublica piece about design. Dear Medical Designer: Should I Give Up Medicine to do Design? What Does Envelope Design Teach Us About Bad Healthcare Design? Why is Healthcare Design So Terrible? I am a pediatric translational researcher with dual training in Pediatric Endocrinology and Pediatric Health Services Research and a Master in Public Health. I am the Robert P. Kelch Research Professor of Pediatrics at the University of Michigan Medical School and I hold a joint appointment at the UM School of Public Health. My research agenda focuses on the creation of Learning Health Systems for pediatric obesity and diabetes, which includes electronic health record workflow redesign, leveraging health IT data, quality improvement, and research innovation. Link to my research page and my CV to learn more about my research and current projects. I speak at design and innovation conferences (TedX Detroit, Cusp Conference, Stanford Medicine X), healthcare/academic centers (Kaiser Permanente Care Management Institute, Brown, Vanderbilt, Harvard, Stanford), federal agencies (Food and Drug Administration) and regional, national, and international healthcare conferences (Detroit Healthcare Leaders Forum, American Diabetes Association, American Association of Diabetes Educators, Pediatric Academic Societies Meeting, World Diabetes Congress). See examples and videos of my talks here. I spend time as a researcher and healthcare professional on social media. I advocate for physicians and other healthcare professionals to be connected online, but I also caution providers need to be careful with these digital tools and their digital identity. Check out my Digital Citizenship Guide for more of my ideas on how to incorporate social media as a tool for healthcare.